PPG’s MVP Business Solutions has made available a new video that allows auto body shop owners, insurers and technicians to hear about issues like repair procedures right from three OEMs and a scanning expert. 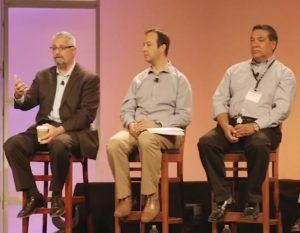 The footage from a PPG MVP Spring Conference panel features Audi collision and workshop equipment specialist Mark Allen, Collision Diagnostics Services CEO Doug Kelly, Toyota Collision Repair & Refinish Training assistant manager Eric Mendoza, and Mazda project manager of project quality Richard Salceda. The panel is moderated by PPG automotive refinish business solutions manager Bob Medved. As PPG indicated, the film features a lot of Q&A with the audience, which makes for a more engaging and real-world discussion than one between just a moderator and panelists. Definitely check it out.